We appreciate all of our donors and the contributions that we receive. To assist our donors in making a contribution, there are a variety of payment methods and plans available; we accept cash, check, credit card, and can set up payment plans annually, quarterly or monthly. We can even set up automatic payments by credit card or ACH to a checking or savings account. If you have a question about making a donation or a question on an existing pledge, please call the Foundation Office and they will be happy to assist you. 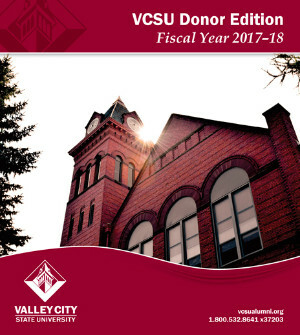 Donations are tax deductible, as the VCSU Foundation is a 501(c)(3) organization. We have tried to make the Donor Edition as accurate as possible in order to properly recognize everyone that contributed this past fiscal year (July 1, 2017 – June 30, 2018). However, mistakes are always possible, and we welcome the opportunity to correct them. If we have missed any donor, or if you feel you have been placed in the wrong giving category, please call the Foundation Office at 800-532-8641 ext. 37203.